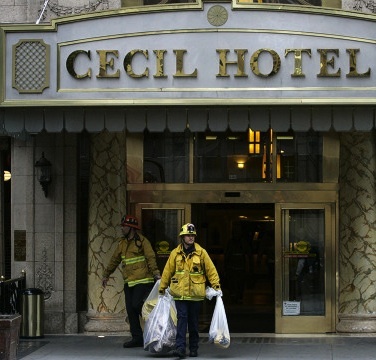 Last week, workers at the Cecil Hotel in downtown Los Angeles discovered the body of a Canadian woman at the bottom of one of the building’s water tanks after guests complained to the front desk about poor water pressure. Authorities said they did not discover live illness-causing bacteria, and the water was totally safe to drink regardless of the pesky dead body that had been marinating in it for almost an entire month. Thankfully, the Department of Public Health disagreed, issuing a no-drink order that disallows the Cecil from letting anything but toilet water flow in their rooms. The next time you see this particular establishment as a booking option on Hotwire, go for Chateau Marmont instead, which is haunted only by the ghost of Lindsay Lohan. Have you taken Biology it makes perfect sense. We drink worse stuff then this. Next Next post: Chris Brown ‘More Violent’ Than Oscar Pistorius!? ?